Order The Complete Idiot’s Guide to the Art of Songwriting from Amazon.com today. Casey Kelly, the writer of several Grammy-nominated songs, lives in Nashville, Tennessee. His many hits include #1’s: Kenny Rogers & Dottie West’s “Anyone Who Isn’t Me Tonight,” Tanya Tucker’s “Soon” and George Strait’s country music standard, “The Cowboy Rides Away.” He works as a session player and singer and performs in Clubs and Concerts for audiences throughout the US and Europe. A frequent mentor, panelist and workshop contributor, Casey is a member of ASCAP, NSAI and he is currently a Songwriters Guild of America Board of Councilors member, and Vice President. 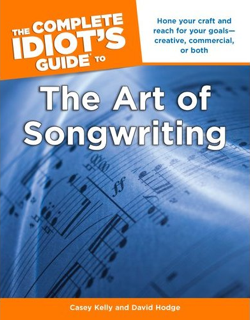 The Complete Idiot’s Guide to the Art of Songwriting is his first published book. David Hodge teaches guitar and songwriting (as well as bass, piano, music theory and more) in Berkshire County, in the southwest corner of Massachusetts and is the author of The Complete Idiot’s Guide to Guitar, The Complete Idiot’s Guide to Playing Bass Guitar, and The Complete Idiot’s Guide to Playing Rock Guitar. Techniques using deliberate rhythm and stylistic changes. The best places to upload one’s work for maximum exposure and opportunities. As a Nashville native, I’ve always been fascinated by music and the music industry. This is one of the few books I’ve found that offers a true insider’s view of the real craft of songwriting. The text is easy to read, and filled with helpful real-world examples. I highly recommend this book if you are serious about becoming a better songwriter. David Hodge’s The Complete Idiot’s Guide to the Art of Songwriting is a keeper, not only for me but also for friends who’ve been involved with the musical end of this art for years. Get an idea what this book is like by checking out some David’s lessons for songwriters on Guitar Noise.